As expected, Samsung has released its follow-up to last fall's Galaxy Gear smartwatch. The biggest change? That it's left Android in favor of a Tizen, an open source operating system that gives Samsung a battery boost and, more importantly, a sense of independence. There are some internal upgrades here worth talking about as well; the Gear 2 gets a boost to a 1GHz dual-core processor instead of the 800MHz guts it sported before, and will be compatible with "dozens" of Samsung smartphones and tablets from launch instead of the limited selection the original Gear was limited to. It also adds a standalone music player and a heart rate monitor, making it a more capable workout companion than it had been. And a shift in camera placement means you can swap out three band colors—black, brown, and orange—which seems to be the last of the perks. After all, it's barely been five months since the original. The Gear 2 will also be joined by the Gear 2 Neo, a device that appears to be essentially the same except that it's lighter, has no camera, and offers a grey strap instead of a brown one for some reason. It will also presumably be cheaper, though it's not clear yet by how much. Or, for that matter, how much the Gear 2 will cost; hopefully less than intimidating $300 price tag that burdened its predecessor. All of which is to say that there's probably not much here to draw you to the Gear if you weren't before, which makes sense given how close the sequel comes to the original. If anything, at least on paper the move to Tizen seems to benefit Samsung more than its customers, a notice to Google that it's willing to flirt with other viable hookups. It doesn't need to be a Galaxy to take on the world. 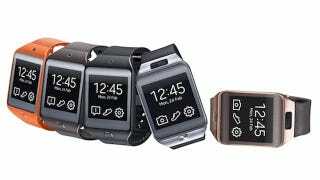 Meanwhile the Gear 2 Neo, which ditches the camera that no one wanted in the first place, and drops ounces that were decidedly cumbersome, could end up being the smartwatch Samsung should have started with in the first place. We'll know more once we've had a chance to play with the Gear 2 and the Gear 2 Neo ourselves, of course. But for now, two things are clear. First, the original Galaxy Gear felt like a beta product because, it turns out, it was. Second, and even more importantly? Samsung's ready to imagine a world without Android on a wider scale than it ever has before. And how that particular experiment goes could have repercussions that go far beyond any two smartwatches.